One of the coolest things about being a part of the International Blues Challenge is the musicians you see and meet that really deliver a strong impression upon you. Running one of the venues during the event puts me in direct contact with many of these artists, and from this contact, strong friendships often develop. Over the past few years there have been a lot of strong acts play in the room, but three have stood out exceptionally highly in my mind; Jarekus Singleton, Mr Sipp, and Vanessa Collier. Not only were they amazing performers who stood out on their instruments and their presence; they also held that stance that you just knew that they were ready to break out in a big way. Mr Sipp won the overall competition. Jarekus was signed to a major label and found himself nominated for Blues Music Awards. Now it’s Vanessa’s turn. Well she has already accomplished the major record label deal, and she is nominated for a BMA this year. But I have the feeling that she’s soon to be a name that everybody is going to recognize, too. Her latest disc on Ruf records, Meeting My Shadow, could just well be what it takes to put her over the top. 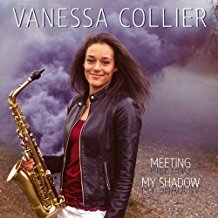 Now if you’re wondering, no, Vanessa Collier didn’t just appear out of nowhere. She did stint touring with Joe Louis Walker’s band and following her highly praised debut recording, Heart Soul & Saxophone, she was featured on one of Ruf’s multi-country tours throughout Europe. She is not only a sensational performer, but her songwriting skills are outstanding and she is a multi-instrumentalist. Though most may recognize her for her stellar saxophone playing, she can also work her way around a number of keyboard instruments, flute, and various percussion including the shuitar. The album features Vanessa with strong guitar work coming from Laura Chavez throughout, joined by Josh Roberts playing slide on a couple numbers. Other featured musicians include TK Jackson on drums, Daniel McKee on bass; Charles Hodges on a variety of keys, Marc Franklin on horns. Covers of “When Love Comes To Town” and “You’re Gonna Make Me Cry” are masterfully recreated. The Sister Rosetta Tharpe piece “Up Above My Head, I Hear Music In The Air” brings a revival feeling that stands out. Her own songwriting expresses both sides of life through her reflections of overcoming pains and bringing joy in turn. Of the original tracks I really find numbers like the opening “Poisoned The Well,” “Two Parts Sugar, One Part Lime,” and “Whiskey And Women” all to be rousing and invigorating. The New Orleans flair of “Meet Me Where I’m At” and the funky socially-aware track “Cry Out” are also stand-outs. Collier has the goods to successfully deliver in any direction she sets forth, which she does remarkable well throughout this outstanding disc.